Join us for an acoustic evening of Americana classics – blues, Bluegrass, and classic hits that twang! 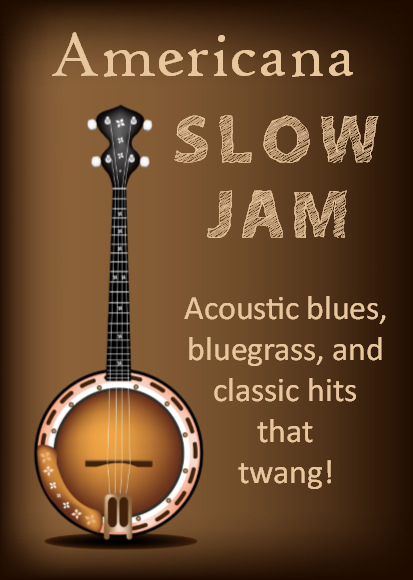 This jam session offers a great entry level experience for those who want to learn how to play with each other in a jam setting, as well as being appropriate for more accomplished or advanced players. Songs are projected onto a screen to help you follow along, and host Steve Latanision will be on hand to help with chords and scales. We'll start with 20-30 well known Americana genre tunes to choose from (including Angel from Montgomery, Old Joe Clark, Will the Circle Be Unbroken, Friend of the Devil, and Rider). You can add your own favorite song if you bring a legible lead sheet. Free admission. Note that this is an all acoustic evening – bring out your guitars, banjos, mandolins, and fiddles. We're also on MeetUp!